Personalized medicine made significant strides in 2011 with two new targeted cancer therapies, the FDA release of its companion diagnostics draft guidance, and routine clinical genotyping for some oncology applications. However, many challenges remain. An estimated 90% of currently marketed drugs are effective in only ~40% of patients annually, costing ~$350 billion for medications that don’t work. Hope may be on the horizon, though, bolstered by new successes and novel approaches in biomarker analyses. GTC’s “Oncology Biomarkers” conference will feature pointed discussions about overcoming challenges to translation of biomarkers to the clinic. It will also showcase emerging technologies for assessing biomarkers, including the use of isogenic cell lines to stratify patient populations, next-generation sequencing for mutational analysis, and identification of unique biological targets. Over the past few years there has been a clear shift in oncology from traditional cytotoxic agents to more molecularly targeted drugs, says Adam Schayowitz, Ph.D., director of business development, BioMarker Strategies. Part of the bottleneck is the way tumor specimens are processed. “Typically, when biopsies are obtained, tissue is fixed using an approach that was developed in the 19th century (FFPE sections). Then static biomarker tests are performed using methods such as immunohistochemistry, DNA sequencing, and DNA amplification. BioMarker Strategies believes one way to bridge the chasm between biomarkers and drug response is by developing a new paradigm for testing tumor specimens. “A better approach,” Dr. Schayowitz suggests, “is to keep the cells alive long enough to obtain a functional profile that would reveal information about the signal transduction networks that predict patient response to targeted drug therapy. Initially, a fine-needle biopsy harvests cells from the patient’s tumor. The sample is then placed in a ready-made cartridge that can be processed in the self-contained instrument. The automated processing takes less than 30 minutes and occurs in steps. First cellular aggregates are mechanically dispersed. Nontumor material is depleted, and the purified cells are distributed in up to four chambers. While some cells are untreated and remain at baseline, others are treated with various stimulators and inhibitors (therapeutic drugs). Finally, samples are lysed and stabilized for off-platform extraction and analysis. 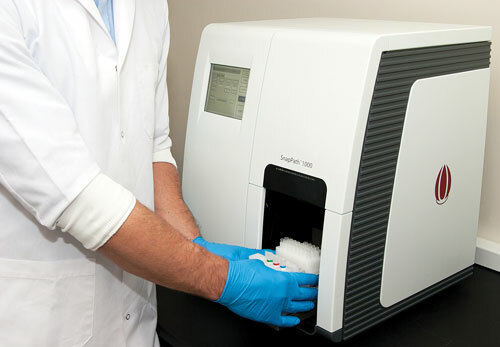 BioMarker Strategies’ SnapPath™ system incorporates an automated, live-tumor-cell processing device with first-in-class, functional, ex vivo biomarker tests to improve drug development and inform clinical decision-making for targeted cancer therapeutics. SnapPath stimulates a patient’s live tumor cells—outside their body—to obtain a Functional Signaling Profile of the signal transduction network that is not possible using static, genomic biomarkers from dead, fixed tissue. Transforming biomarker data into clinically relevant companion diagnostics requires overcoming several key challenges, says Andrew Grupe, Ph.D., senior director of pharmacogenomics discovery research, Celera, a business of Quest Diagnostics. “One hurdle is regulatory issues that inevitably arise. These require peer guidance by collaborating with experts who can help transition biomarker assays from research to diagnostic. Second, one needs to address reimbursement issues. In order for tests to be reimbursable, there must be proven clinical utility. For example, we are working with Medco to determine whether genetic testing could impact compliance of patients on statins. According to Dr. Grupe, the use of isogenic cell lines can be a powerful means for assessing biomarkers that help stratify patient populations. Since hundreds of cancer genes have now been characterized, it is possible to examine specific genetic mutations and evaluate how these interact with the rest of the cellular apparatus to modify patients’ responses to specific treatments. For example, mutations in K-Ras, BRAF, and PI3K may impact response to cancer drugs. Autoantibodies are present in many conditions such as cancer, autoimmune disorders, and transplant rejection. This affords an opportunity to develop diagnostic and prognostic assays, as well as to monitor disease progression and treatment effectiveness. There are several challenges, however. “Only a fraction of patients develop autoantibodies to a given protein,” indicates Lisa Freeman-Cook, Ph.D., senior manager, R&D, Life Technologies. Dr. Freeman-Cook says the utility of the ProtoArray for identifying biomarkers was demonstrated recently by investigators looking for novel autoantigens in rheumatoid arthritis, prostate cancer, and Alzheimer disease. But the next step is validation of identified biomarkers. Since the ProtoArray was not designed for high throughput, the company decided to employ Luminex xMAP technology. The company markets ProtoArray products and provides ProtoArray and ProtoPlex custom services. “We feel that combining these two technologies now not only supports biomarker discovery for a wide variety of diseases, but also allows validation with the familiar Luminex technology,” Dr. Freeman-Cook remarks. 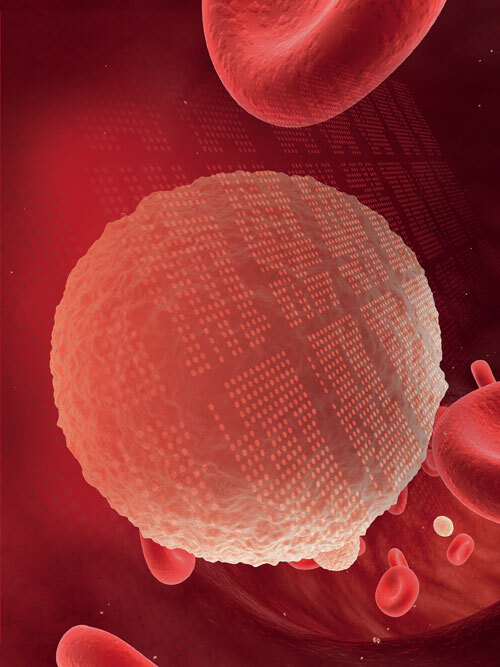 Life Technologies’ ProtoArray® Human Protein microarrays, containing more than 9,000 purified full-length human proteins, can be used to identify autoantibody biomarkers from blood for a variety of diseases. These biomarkers have applications in disease diagnosis or prognosis or in monitoring treatment efficacy, according to the firm. Once identified, the autoantibody biomarkers can be validated using the ProtoPlex™ Immune Response Assay featuring Luminex® xMAP technology. Most biomarker analyses are generated by excising tumor samples from patients. A noninvasive means, however, is assessing biomarkers in body fluids, such as urine. One drawback to the use of body fluids is the low concentration of analytes in the sample, notes Anthony P. Shuber, CTO, Predictive Biosciences. According to Shuber, Predictive Biosciences is utilizing next-generation sequencing to detect biomarker mutations. The company collects a small sample of urine from patients and then subjects it to next-generation sequencing to determine the presence of mutations. More than 250,000 women are diagnosed in the U.S. with breast cancer every year. A majority of patients (~170,000) are estrogen receptor positive (ER+), and subsequently receive a regimen that includes anti-estrogen therapeutic agents such as tamoxifen or aromatase inhibitors. A&G Pharmaceutical has identified one such biomarker called GP88. “This is an autocrine growth and survival factor produced, secreted, and absolutely required by the cancer cells. A&G has performed studies demonstrating that this biomarker plays a critical role in cancer development, invasiveness, and for the survival of breast and lung cancer. Leading investigators in the field suggest that within the next five years, oncologists and their patients will have many more therapeutic options. Perhaps as many as 25 molecularly targeted agents for cancer therapy will be available. Within this time frame, virtually every possible mutation will have been identified in the genomes of the most common cancers. This will allow increasingly effective monitoring of the treatments for cancer by examining robust biomarkers from samples obtained by minimally invasive means. “Leukemic cells don’t live in isolation; they’re interacting with their environment within the bone marrow, they’re interacting with their environment in terms of the blood that flows by them,” explains Steven Kornblau, M.D., professor at MD Anderson Cancer Center. Dr. Kornblau is working to understand how the cytokines and chemokines that the leukemic cells might be getting exposed to also affect protein expression. The idea that researchers in his lab might find different cytokine and chemokine expression patterns within leukemic cells led to determining ways to profile large numbers of cytokines. The researchers considered using ELISA kits for the chemokine and cytokine studies but realized that this approach would require a significant amount of sample, plus there was concern about the impact of batch effects on results. The lab used the Bio-Plex Pro™ human cytokine 27-plex assay to study a large panel of serum samples from acute myelogenous leukemia (AML) and myelodysplastic syndrome (MDS) patients (178 AML and 114 MDS samples). Because MDS is often considered to be “preleukemia,” one of the questions to be addressed was whether MDS and AML exhibit similar or unique cytokine patterns. Analysis of data generated in this study led to segregation of patient samples into eight different signatures. Identification of these signatures led to their correlation to different clinical leukemic features such as cytogenetics, outcome, and remission duration. The results of this research set up the idea going forward that chemokine and cytokine patterns can be used to inform different therapies and enhance the ability of clinicians to affect leukemic cell growth or eliminate the resistance of those leukemic cells to different therapies already in use, according to Dr. Kornblau.